Daly attended the prestigious conference on Oct. 19 in Ann Arbor, Mich. She heard from featured guest speakers and industry professionals such as Jeff Wilpon, Chief Operating Officer for the New York Mets; DeMaurice Smith, Executive Director of the NFL Players Association; and Estee Portnoy, Senior Vice President of Marketing for Live Nation. “The panelists provided a lot of insight into where the sport industry is headed, and I am definitely more interested in eSports and analytics after hearing from the speakers,” said Daly, who is from Ellicott City, MD. Launched in 2013, the BIG Initiative annually recognizes outstanding student leaders in sport business who have achieved an exceptional level of success. Each year, the MSBC attracts top applicants from across the nation. Those receiving the honor are selected on the basis of demonstrated entrepreneurship, creativity, innovation and leadership. Nominees must be students with a passion for the sport industry that demonstrate a truly remarkable curriculum vitae. 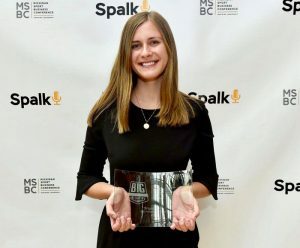 Daly completed her senior capstone in Fall 2018 at Van Wagner Sports and Entertainment in New York City. She previously interned with the NFL, Inside Lacrosse and participated in a job-shadowing program with the Washington Wizards.